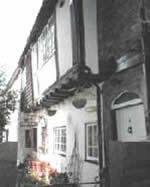 Jireh Cottage is a 15th century medieval building in Hugh Place, Faversham. Hugh Place is a passageway off Market Place, opposite the Guildhall in the centre of the town, noted for the number of listed buildings. 'A messuage with a garden called the Fleur de Luce for One shilling and Sixpence and half a seame of barley'. In the 1550s the innkeeper was arrested for complicity in the murder of Thomas Arden, reputedly planned on the premises. There have been numerous alterations and rebuilds, especially the frontage, which was entirely replaced in the early 18th century. However, Numbers 1 and 2 survive from the medieval building. The remaining crown post indicates construction in the 1450s. Jireh Cottage is the home of Dave and Sue Lamberton, who have recreated the atmosphere of the original medieval building, using authentic clothing and tools, as well as cooking contemporary culinary delights! The interior has been altered over the centuries, with timbers removed to accommodate fireplaces and changes in room space. Dave and Sue have replaced some 'missing' beams in the upper floors and attic and built a staircase to replace the loose ladder that led to the bedroom. 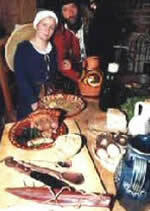 Sue and Dave are dressed in typical mid-medieval wear, taken from contemporary pictures, woodcuts and descriptions in texts. As 'craftpersons' or artisans, they could afford a better quality of wool. Clothing had no pockets and so coins were carried in a 'scrip' (leather bag) attached to a belt, along with a small personal knife to cut and eat with (forks were not popular till much later). 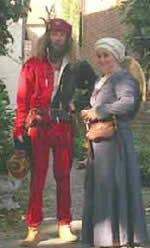 Both Dave and Sue are members of the Medieval Siege Society, which recreates the lifestyles of people living and fighting during the War of the Roses. All men were expected to be accomplished archers. Jireh Cottage is part of the Faversham Society's annual Open House scheme, in which historic properties not normally seen are open to the public on the first three Saturdays in July. Details about Open House can be obtained from the Fleur de Lis Heritage Centre, Preston Street.